Australian Paddle Sports Pty Ltd was originally founded in Sydney in 2012 by Brett Greenwood & Matt Blundell with the sole aim to provide the Australian market with a range of quality premium paddling products from around the world at a competitive price. Brett is a multiple gold medalist in both masters sprint and marathon paddling at both State, National & International level, has achieved line honours in the Hawkesbury Canoe Classic, Murray Marathon and Myall Classic Marathon, has competed in over 60 Ocean ski races and in 2011 completed a solo and unassisted crossing of Bass Strait in a sea kayak. In 2016 he won a silver and bronze medal at the Canoe Marathon Masters World Cup in Brandenburg Germany and was awarded the 2016 Australian Canoeing Masters Marathon Paddler of the Year. In 2017 he won gold in both the K1 & K2 at the Canoe Marathon Masters World Cup in Pietermaritzburg Sth Africa against some formidable competition and in 2018 won a gold medal at the Canoe Marathon Masters World Cup in Prada Vila Verde in Portugal in the Mixed Doubles event. Brett also holds an AC Level 1 Flatwater coaching certificate and is an AC Marathon Official. Matt has competed at National and International levels in kayaking in flat water sprints, marathon and multi day river marathon races for over 20 years. He has won the World Masters Canoe Marathon Championships, Hawkesbury Canoe Classic, NSW State Marathon Championships, National Marathon Championships and well as achieved podium finishes in numerous adventure races including the NZ Coast to Coast race, AROC, XPD, Geo Quest and Max Adventures. Matt is also an AC Level 1 Flatwater Coach and Assessor. Brett and his wife Jill took ownership of the business in 2014 so Matt could concentrate on his retail outlet Prokayaks. We are the exclusive Australian importers of Vajda and Carbonology Sport canoes, kayaks and surfskis and in early 2017 became the exclusive importer of Jantex Professional Paddles from Slovakia. We also import Kayak Centre river boats from South Africa and Kick the Waves wildwater boats from the Czech Republic.We also sell a range of clothing and accessories that is well suited the paddling market. Our team believes these products to be the best quality products on the market today and are continually expanding our range to provide quality paddling products to the Australian market. The Vajda (pronounced VIDA) brand is synonymous with success and victory all around the world. We chose to stock the Vajda range of Canoes, Kayaks and Skis as we felt the Australian market needed a European built product that was synonymous with quality at a competitive price. Vajda focuses on detail and have a unique understanding of customer needs. They also have a wide portfolio of canoe products to help us satisfy all our customers specific requirements. Vajda not only offers the top level of production for Olympic champions, they also offer high quality models for developing athletes and recreational paddlers. With the most progressive technologies in the sporting industry all our paddlers can fully enjoy premium quality when purchasing a Vajda product. Vajda is a family company founded in 1991 by 2 brothers, Marcel & Rene Vajda, who excelled in wild water racing. The company now employs 60 people and produces 1,900+ boats each year for many canoe disciplines. Vajda boats are manufactured by qualified tradesmen, most of whom are paddlers themselves, using only the highest quality composite materials. Vajda quality is ensured as they are only made in their factory in Slovakia and no products are made under licence externally. Whilst a large company Vajda still maintains the ability to provide customised orders to suit specific client needs. Australian Paddle Sports supports Vajda with any warranty work required as well as stocking a full range of accessories for ongoing customisation of your boat. We took over the importation of Carbonology Sport Surfskis in 2015 to offer our Australian customers the best of what South Africa has to offer in Innovation, Technology, Quality and Value for money. advanced composites and lightweight systems technologies. Jason comes from an engineering background and composite development, specializing in wind energy. Carbonology Sport produce both Beginner, Intermediate and Advanced Surfskis including what is regarded as the world’s fastest Double Ocean Racing Ski and the world’s first Sit-on-Top Kayak for downriver racing. Australian Paddle Sports supports Carbonology Sport with any warranty work required as well as stocking a full range of accessories for ongoing customisation of your boat. In late 2015 APS were invited to distribute Jantex paddles also from Slovakia. Jantex paddles are made of the highest grade carbon graphite fibres and epoxy resin. They produce a range of shaft types and blades to ensure the perfect paddle can be made for both professional flat water, surf ski & down river paddlers as well as touring paddlers & children. With a choice of 4 shafts, 5 blade shapes and over 10 sizes in each shape the perfect paddle is guaranteed. Jantex technicians use the best lab rats – the world’s top paddlers. Rene Poulsen has helped to test and refine the latest Jantex Beta Rio range of blades. Paddling legend Max Hoff had a hand in the new Jantex Gamma Rio blade design. In early 2017 APS were awarded exclusive importers of Jantex Paddles into Australia. We support Jantex with any warranty work required as well as stocking a full range of their shafts and blades for ongoing customisation of your paddle in Australia. We custom assemble all paddles in Australia to suit our clients specific needs. We only use Jantex shafts as we believe no compromise should be made to make the perfect paddle. With their continual inventive designs Jantex Paddles are simply the best in the world! Kayak Centre is owned and run by father and son Rick and Clive Whitton. Each Kayak Centre craft is hand finished by Rick or Clive to ensure it meets your individual specifications. They put their vast experience back into the design and construction of your craft. The craft they produce is designed,constructed and tested to withstand the rigorous demands of the South African river racing conditions. In order to stay at the leading edge of the industry, Kayak Centre draws on the experience of sponsored athletes to continually improve their products as well as drawing on the expertise of world leaders in the composite and fibreglass industry. Since 2005 all craft are the result of Computer Aided Design (CAD) Technology, new-age design philosophy, personal attention to detail, and experience as manufacturers and paddlers. Australian Paddle Sports commenced importation of Kayak Centre products in 2016 to service the demand for economically well priced quality composite river boats. 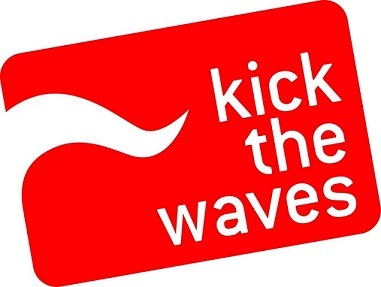 Kick the Waves hail from the Czech Republic and since 2003 have been producing high-tec composite boats and other water sport equipment for wildwater racing. Head designer is Tomáš Slovák – double world champion in wild water K1 category and winner of 27 medals from WW Europeans and Worlds Championships. Kick the Waves offer 13 different boat models which can be manufactured in 5 different constructions to meet the needs of our customers. Australian Paddle Sports commenced the importation of custom built Kick The Waves boats in 2017 to meet the needs of our wildwater clients. One Giant Leap are an award winning company from New Zealand who develop power measurement technology for paddlesports. These state of the art Canoe/ Kayak power meters are used by multiple national federations and individual athletes at all levels around the world. Unlike heart rate monitors, which measure the body’s response to intensity, or GPS boat speed measuring devices and stroke rate sensors, which are affected by environmental conditions (water current, wind speed, water density & water temperature), a power meter provides you with a direct measure of your energy output. This direct and objective measure of intensity is immediate and power values can be compared from day-to-day, independent of environmental conditions, equipment (boat, paddle length & blade type) and paddling technique. Australian Paddle Sports are the exclusive importers of the One Giant Leap 100% carbon-fiber kayak shaft which has been instrumented with force and motion sensors in order to measure the power-output, force and stroke-rate of a paddler. Australian Paddle Sports does not stop with just supplying boats and paddles. We also distribute the full range of Rhino Rack, and Vaikobi products from Australia plus some essential paddling products from Reed Chillcheater in the UK. In 2017 we added Funky Pants to our clothing range simply because they are seriously funky and incredibly comfy! In 2018 Azur Ocean wear was introduced to meet the needs of our female paddlers. As the Australian distributor of some of the worlds best brands of skis, kayaks and paddles our aim is to be able to satisfy our customers’ every need. As such we carry a wide range of parts and accessories for all of the brands and models that we represent, and if we don’t have a particular part in stock we can certainly get it in for you. Our products are continually expanding as the sport and market develops. Our nationwide network of dealers can provide you with all the information needed to choose the right product for you.